The Wayne State Warriors extended their unbeaten streak to four games last weekend, with a decisive 5-3 victory and a hard-fought 1-1 tie against visiting Rensselaer. The Warriors move to 7-4-1 on the season, and offensive powerhouses Melissa Boal and Sam Poyton maintained their 10-game point streaks. To say Boal and Poyton were both critical factors in Friday’s game would be an understatement: they, along with fellow junior Lindsay DiPietro, were responsible for all of the Warriors’ points. Poyton, who was named both CHA and USCHO Player of the Week last week, got the scoring started at 6:38 of the first period, with assists from Boal and DiPietro. After Rensselaer evened the score a minute later, Boal unleashed a hat trick, briefly interrupted by a Laura Gersten tally for the Engineers. Rensselaer retaliated with a power play goal midway through the third stanza to pull within one, but DiPietro and Boal set up Poyton for her second goal of the game (her 12th of the season) to seal the 5-3 win for the Warriors. Senior goalie Tiffany Thompson (pictured) had 25 saves for the Warriors. Saturday’s game was a defensive showcase, as both teams could only score once: Rensselaer lit the lamp first early in the second period, and Poyton, with assists from Boal and DiPietro, knotted the game up five minutes later. 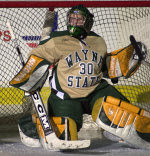 Thompson kept the game even for the Warriors; she recorded 23 saves, including three in overtime. She was awarded #1 star accolades for her performance. The game was Thompson’s fourth consecutive victory. This weekend, the Warriors will travel to Hamilton, NY to face Colgate.